Yesterday, before the match it woz aall 'doom and gloom' with the threat of 'a good hidin' from the current champions and the threat that Rafa woz on the verge of quittin due to lack of signins in the transfor window! 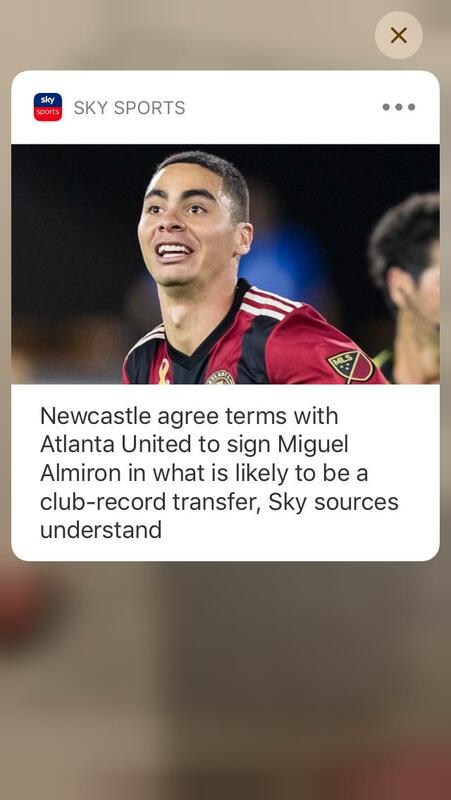 And then 'a glimmer of light' az we drank in The Bodega pre match, when SKY telly told us that THREE singins were imminent and that NUFC were aboot to break wor transfor record by signin Paraguayan international from Atlanta United for £20 million quid! Aalso in the offin woz the predicted loan signins of Andreas Samaris from Benfica and Antonio Barreca from Monaco! 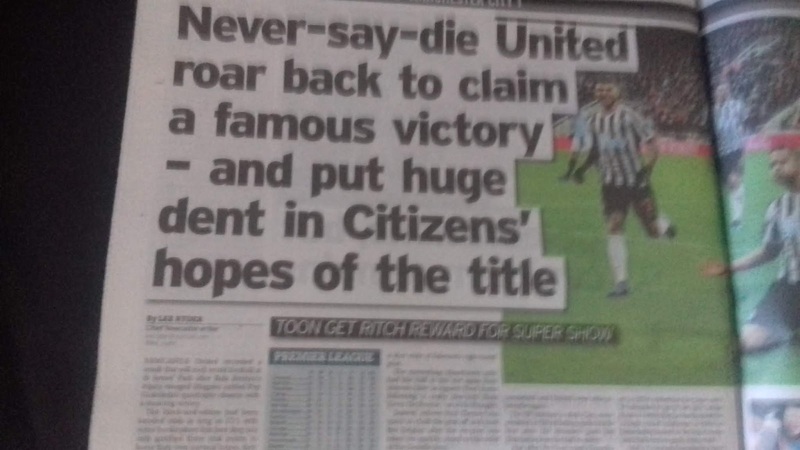 This lifted the gloom in the bar which woz full of Toon and Man City fans, givin us hope that at last wor beloved owner? 'The Fat Controller' had 'seen the light' and woz puttin hiz hand in hiz pocket and that Rafa wouldnt 'waalk'! However! That 'hope' woz dashed after just 24 seconds of the match startin when Aguero scored at The Gallowgate End with wor defence 'asleep' to put Man City 1-0 up after a scramble in the box! At this point we feared 'a cricket score' but to wor credit we 'knuckled down' and somehow got to half time with just the one goal conceded! The 2nd half iz wot dreams are made of az we fought back and battled on and an unlikely equaliser came through Soloman Rondon who got hiz foot to the baall from a cross and toe poked it into the net to level things on the hour mark! 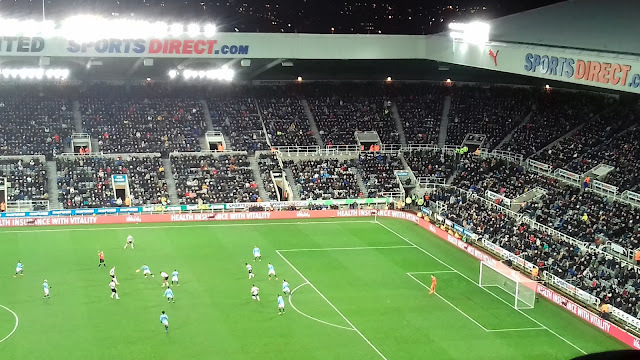 Could we hang on for the precious point we thought, but NUFC had better ideas and we got a penalty not lang after, when Longstaff woz pushed ower in the box in the 77th minute! 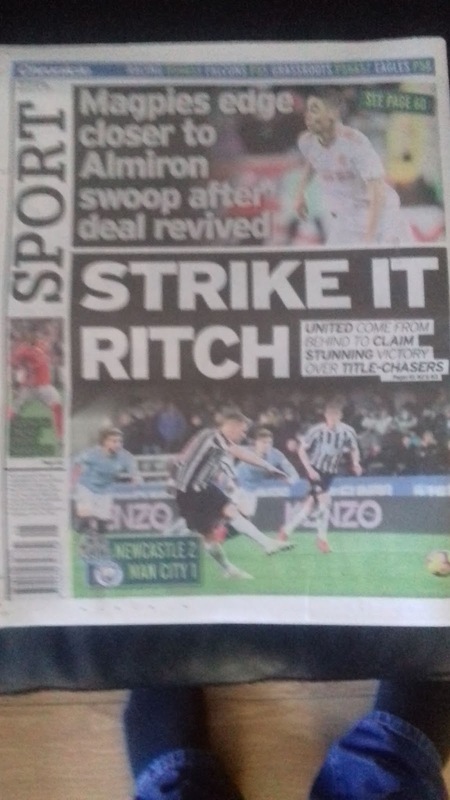 Matt Ritchie would take it, but The Blue Moonies adopted delayin tactics az Edison their goalie 'fained injury' to try and put Ritchie off az he waited 3 lang minutes to take the spot kick! It worked a treat FOR US az he hammered the baall to the right on the goal to put us 2-1 up az the roof woz lifted off the groond! 5 mins stoppage time woz played az we pulled wor hair oot by the roots and bit wor finger nails to the bone, but finally the ref blew for full time az the crowd went ballisic! This woz the forst time we had beaten Man City in 23 attempts and the totally unexpected win propelled us up to 14th in the table, 5 points above the relegation places! Happy days to replace the miserable ones at last! Toon team: Dubravka, Yedlin, Schar, Lascelles, Lejeune, Richie, Perez (90 Manquillo), Hayden, Longstaff, Atsu (Kenedy 87), Rondon. 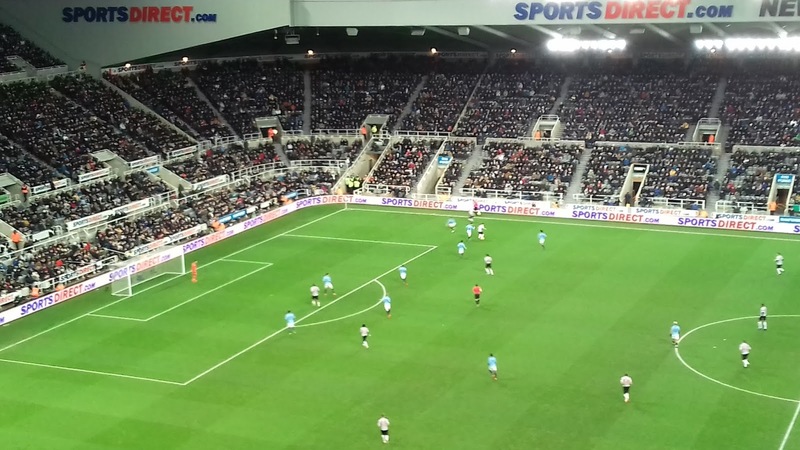 For the benefit of Toon fans from ootside the north east and owerseas!